When we are young, we invent different futures for ourselves; when we are old, we invent different pasts for others. How reliable is our memory? How accurate are our thoughts, analysis of situations, perception of people? Yet we live by them and interpret our experiences through their lenses. The winner of the 2011 Man Booker Prize, Julian Barnes’ The Sense of an Ending plays with these subjective faculties and crafts a scenario that’s captivating and with a touch of surprise at the end. A man in his 60’s looks back at his life, focusing on what he can remember about his relationships and their aftermath. With these words at the beginning pages of the book, Barnes has quietly laid the enquiry of his story. Post-secondary life leads them to different paths. Adrian, not surprisingly, gets into Cambridge on scholarship, while Tony goes to Bristol to read history. There, he starts to go out with Veronica Ford. One weekend, Veronica brings him home to meet her family. In Tony’s memory, that is a humiliating episode. He leaves with bewilderment: Veronica’s aloofness, her father’s joking insults, her mother’s mysterious gesture, and her brother’s silent wink. After that, Tony introduces Veronica to his friends. Naturally, she strikes up a good rapport with Adrian right away, with a common tie of Cambridge where her brother also attends. Later, Tony and Veronica break up. Adrian soon starts to date Veronica. As usual, Tony seems resigned to his circumstances and moves on with his own life, and assumedly, others too with theirs… until later he hears the shocking news about Adrian. Time flows by, Tony marries a less mysterious Margaret, has a daughter Susie, and years later, his marriage ends in divorce. Tony is now retired in his 60’s, expecting a life that’s bland and uneventful. Retired life for him is a natural drift of time, flat and oblivious. But he’s roused by an unexpected letter from a solicitor one day, naming him to receive £500, a bequest in the will of someone he has only met once forty years ago, Veronica’s mother. What’s more intriguing is together with this money, he is to be left with Adrian’s diary. Life to Tony now is a quest for finding out what had actually happened to these people. His investigation has cast fearful doubts on his own memory and sense of personal history. In his retirement, Tony is awakened to re-interpret his past. … the history that happens underneath our noses ought to be the clearest, and yet it’s the most deliquescent. In just 150 pages, Barnes has opened a floodgate of inquiries into our subjective mind, carrying us through with a tantalizing story, towards an ending that, I feel, is a tad bit sensational, however reserved the tone. Nonetheless, I come out of the reading experience marvelling at the power of the economy of words in the hands of a master storyteller. The Sense of An Ending by Julian Barnes, published by Random House Canada, 2011, 150 pages. Hi Arti – thank you for this thoughtful review! – I just heard Julian Barnes interviewed on NPR this weekend [it is likely online], his thoughts on memory and the history of our own lives was enlightening, so I am curious to read this… your review only spurs me on to get it immediately and put it on the top of my TBR pile… so as always, thank you! I must get a copy of this… Great review! Thanks… I’m sure you’ll enjoy it, Michelle. How reliable indeed. Thinking on that. It’s interesting to hear my kids who are now adults tell me their memories of a time growing up that seems so foreign to me. The book has convinced me that memories are so subjective and highly selective too. But if you’ve great family relationships, I’m sure no matter how different and ‘foreign’ they are, you’ll enjoy your children recounting what they think is reality to them… the rewards of good parenting. generally people recall their pasts sitting inside the home or share it with the family members or friends but here in this novel Julian Barnes’ protagonist is characterized as an immense passionate about questing past incident which he faced once in his lifetime. i think all incidents move around these above said quotations. It is a great inspiration to retired and non-retired as well. There are many more thought-provoking lines in the book. I’m sure you’ll find them meaningful. Thanks for visiting and leaving your comment. I was surprised how the book stayed with me after I finished it. Barnes deserved the award. This is my first Barnes book. I’m sure I’ll read more of his works in the coming days. Thanks for leaving your comment. thanks for this kind suggestion. i have not gone through this novel yet. But I assure i’ll follow important quotations. I didn’t read this post, Arti, because I have the book on my kindle and want to be surprised. When I read the book, I’ll come back and reply (even if it’s a year from now!). I’m so glad I didn’t reveal more in my review… I was debating whether I should or not. And if I did, I’d put the warning “Spoiler Alert”. Anyway, glad I didn’t. I’m sure you’ll be back to share with us your response after you’ve read it… as you’ve done with other books and movies. I know it could be years (like Miss Porter 🙂 ) but you’re welcome anytime! I saw this post last night but bookmarked it to read today (too much going on yesterday). I am really looking forward to this book. What you’ve described, is exactly the type of book that I enjoy and I’ve never read any of his books. You’ll never know… there are lots more that I didn’t include here so not to spoil your reading experience. 😉 But I’m sure you’ll enjoy it. You may be aware from my blog that Julian Barnes is one of my all-time favourites. Have you read his Brief History of the World in 10 and a Half Chapters? I loved that. I have this book to read and am looking forward to it a great deal. If I can squeeze it in before Christmas, I will! This is my intro. to Barnes. After reading it, I know I’m going to read many more of his works. Thanks for telling me about Brief History… I’ve heard of it before. It’s on my TBR list now. thank you for your review which i enjoyed …. i thought the book sublime and, in the most part, so believable ….. i feel that we don’t so much lie to ourselves but rather tell our stories from our own subjective perceptions. Having just finished it I am about to re-read it – there is so much within those 150 pages …. Welcome! Yes, not only are our perceptions subjective, our memories are often selective as well. I’m sure you’ll enjoy your reread every time… like the author is saying, we may pick out certain things we remember, but not others. So I’m sure our pleasure with it is new every time. Thanks for stopping by and leaving your comment! I love these phrases – “imperfections of memory” and “inadequacies of documentation”. I suspect anyone who undertakes genealogical research, as I have of late, comes to believe that reconstruction of the past is as much art as science. I mentioned my discovery about Aunt T – truly, a stunning discovery about a beloved member of my own family. What’s most amazing is that everyone else in the family knew about “it” except my cousins and I – there seems to have been a family pact to protect the children. I know it’s not very polite to be so oblique about this, but I’ll get the story written soon enough. In the meantime, I’ll echo what you hint at: we’re constantly in the process of reinterpreting our past – at least if we’re open to the secrets it contains. A sidenote: Durrell’s “Alexandria Quartet” is constructed in a way Barnes would appreciate. The first volume, “Justine”, tells the story. Then, it is told three more times in three more books, through three more main characters. Durrell describes his structure as “sliding panels”, that reveal layer upon layer of truth. Now I have to read Julian Barnes, if only for comparison with Durrell! As someone undertaking genealogical research and possibly contemplating a memoir (? I do look forward to that), you’ll find Barnes’ book stimulating. How are we to write about the past if we’re not certain about our own perceptions or doubt the reliability of our memory? And, whose memory? And yet, it’s the vagueness that makes it intriguing, isn’t it? I hope to read more stories of Aunt T.
Great review! This is the best book I’ve read all year (and I read a lot of books!) and it has dispelled my disenchantment with literary fiction. Hope you’ll continue to enjoy literary fiction. Thanks for stopping by and leaving your comment! I was very happy that Barnes finally won the Booker. He is a marvelous writer. I haven’t read this one yet and didn’t really know what it was about but now I do, so thanks! And it is so short too! I had no idea. Sometimes I think writing a short book is more challenging for authors than writing a big fat sprawling one. Yes, there were some debates about “readability” and “literary quality” among the shortlisted titles, as well as among jurors I read. Barnes’s book has demonstrated these two are not necessarily dichotomized entities. As for short books? I’m always on the lookout for them. Wonderful quotes! I have been meaning to read Julian Barnes for quite some time. The way you have written about this book convinces me that it is one I would really enjoy. Have just placed a hold at the library, but the list is quite long. It may move quickly since the book is short… fingers crossed. There are lots more quotable quotes in there which I’m sure you’ll find fascinating. As a slow reader, I’m always excited to find a short book which can deliver the intensity and satisfaction as a much longer work, something I can finish in a few sittings. Hope to find more in the future. Wow. You have certainly piqued my curiosity with your (as usual) perceptive review. I’ve put it on hold at my library — I’m 89th. Which should work out pretty well given how many books are sitting on my shelf (and on the iPod) waiting to be read. I know exactly what you mean, and how you feel. I’ve got boxes of TBR’s! But since this one is so short, I’m glad I’d moved it forward. And… know what I’m reading on my iPhone? Anna Karenina. Don’t think I can finish that anytime soon. I think it is a revival of the past which Tony has already forgotten as he leads an empty life after retirement. What do you think? There must be a certain thing that stirs any being and the same thing happened with Tony when he received an unexpected letter with £500. That’s when he started moving forty years back to find out the lives of his school buddies. 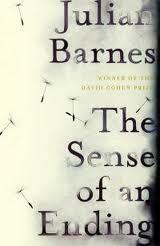 Barnes succeeded in showing there’s uncertainty about our own perceptions and doubt in the reliability of our memory. I came to the point that every retired person has the deep attachment with the past. I think memories are not just for the ‘retired’. It’s the capacity to store them that’s so fascinating. The book is like a pebble thrown into the pond, the ripples are ours to create. Sounds interesting! I wish my “to be read” pile was not quite so high — I fear it’ll be a long while before I get to this one. I should take a speed-reading course, lol. I am so delighted that Julian Barnes won the Booker! I enjoy his writing (esp Flaubert’s Parrot, his first, I think) and look forward to reading this book as soon as possible. Thanks for a marvelous review, Arti, and also for leaving those very kind wishes at the window. I suppose by winning the Booker, he has silenced the debate between ‘readability’ and ‘quality’. I’m curious to know your thoughts after you’ve read it. Also, the window is always a chance to send in a breath of fresh air. It’s always my pleasure to read and respond there. Glad you’re excited about this. Hope to hear from you about your response after reading it. Short book! When I was reading your review I thought, “This looks good but I don’t know if I’d ever get through it — must wait for a long winters evening or one of those endless summers with lots of time in the sun. I could do this in due course! It really does sound fascinating — the sort of thing that would show up on Masterpiece! You always add to my list. Sigh. But a good sigh! I think its being such a short book adds to its appeal. Not too many people have the time to read long novels. I’m sure you’ll find this one fascinating. This one is waiting by my bed, and everything I hear about it makes me want to give it a go – but somehow it stays by my bed! Thanks for your sensitive review. It’s only about 150 pages,so won’t take up too much of your time. It’s the aftereffects that would likely be time-consuming. i love stories like this involving memory –waiting for my turn at the library for this one. I’m sure you’ll enjoy this one. This should be a breeze for you, having read 110. I just finished this book and loved it. So many great quotes and insights. I will read it again for sure. Here’s one of my favorite paragraphs. Welcome! Yes, I remember this paragraph and find it poignant, esp. with Tony looking back and regretting what he has/hasn’t done. But then again, that’s the tragedy, isn’t it? A life full of regrets and unable to make amends. This is one book that definitely deserves multiple reading. Thanks for your thoughtful comment! So my turn finally came to read this book (I was number 34, I think, in line on the library’s hold list). My initial reaction was awe at the elegance of the prose and how often I flipped back to pause over a phrase or paragraph. But later, as the story sank in, I felt something like what you’d written — that sensational twist… I felt like I’d like to know Adrian better and Tony less. Thank you for this review. I’ve been meaning to read this book! I have finally read and reviewed this book, Arti. I liked it a lot. I thought of McEwan and I read it too … I suppose it’s not surprising. This was my third Barnes, though my second one was a delightful nonfiction one called Pedant in the kitchen. I have Arthur and George in my TBR pile. I need to get to it.